Our professional hand-spliced Wire-to-Rope Halyards feature high quality, very flexible 7x19 stainless steel cable taper spliced to very low stretch Dacron yacht braid. The kits are furnished with the appropriate heavy duty stainless thimble and oval compression sleeve for installation by the yachtsman. 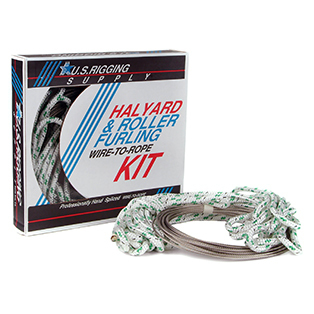 Spinnaker halyards with stainless steel snap shackle. Available with black, blue, red or green tracers. Custom lengths available.